This is the strategy that will allow you to trade with the same odds that insurance companies, casinos, and professional traders use to make money consistently. Now you can learn how to select and sell very far Out-of-the-Money Commodity Options the same way professional traders have done for years. A part of the playing field between the pros and individual investors has been leveled and you should learn how it works as soon as possible. If you trade for income, this is a game- changing strategy that most option traders have never seen or used. In easy-to-understand language, this two-hour read is your gateway to a simple, smart strategy. Nothing is held back, no software to buy, just a logical, common sense strategy that most traders have never heard of. -- This method can place some of your income outside stock market risk. No matter if stocks are up, down, or neutral, these strategies work year round. Learn where and how to locate some of the strong seasonal price tendencies of ag commodities - and then to select advanced option strategies to exploit them. Full page illustrations using actual trades in the examples. This type of trading is not for everyone. If you truly want to trade differently, you must be willing to learn something new. We highly recommend you have some experience trading options - and if you just happen to be "a little smarter than the average bear" - that will help too. Learning to apply smart option strategies with strong seasonal price patterns of ag commodities can put the wind in your sails. It's simply a smarter way to trade. If you've been trading stock options but not making enough, this is the alternative you need to learn. This could be one of the most profitable investment books you will ever read. 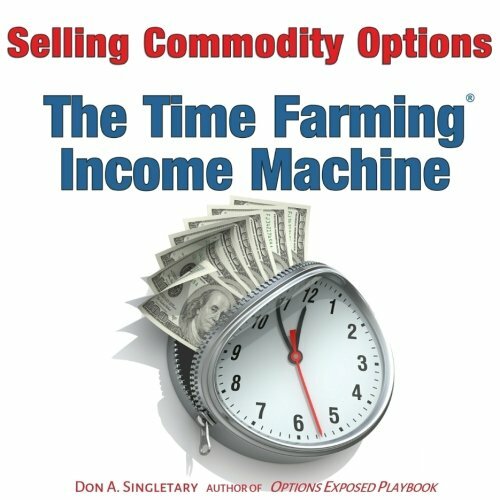 About the author: Don A. Singletary has over 20,000 hours of experience trading commodity options & private commodity risk management hedge consultant for 25 years for major corporations. In this work, he help set up, run, and evaluate hedge risk management funds for his clients in a number of commodities. He has been published in Stocks & Commodities, Futures Magazine, and numerous blog appearances and radio shows. A former college professor and rep for the Florida Department of Commerce's Economic Development Division, he is a licensed engineer who started his own commodity consultant company in the 1990's. He delights in helping traders of all ages learn to meet their financial goals - and he conducts live training workshops two or three times each year near Atlanta - and also in Florida.